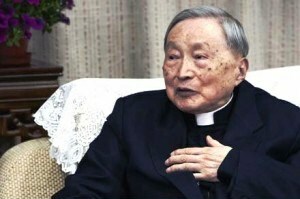 Bishop Jin was born June 20, 1916 in Shanghai into a family that had been Catholic for generations. He soon became an orphan (loosing his mother at 10 and his father at 14) and attended Catholic schools, first with the nuns and then the Jesuits. At age 22, in 1938, he entered the Society of Jesus, his new family. His early adulthood was a time of great upheaval in the country; fall of the empire, the birth of the Republic and a pervasive social instability due to internal power struggles within China and colonial influences of the great Western powers. This also affected the Church, which sought to modernize and integrate into Chinese society and which, in 1946, began to ordain bishops of Chinese nationality. The victory of Mao Zedong in 1949, billed as the "rise" of China on the world stage, had drastic consequences for foreign missionaries and the Catholic Church headed by the Pope, branded as the "stray dogs of American capitalism." Young Jin, like other believers, was divided between loyalty to the Church and love for his homeland. Jin Luxian returned to China and Shanghai in 1951, under Bishop Ignatius Kung Pin-mei, also educated by the Jesuits. In previous years he had been formed in France and Italy, in Rome. In 1955 he - along with Msgr. Gong and hundreds of other priests and laity - he was arrested and held in solitary confinement for five years. In 1960 he was sentenced to 18 years in prison, Msgr. Gong was sentenced to life imprisonment. Rumors claiming that Jin "talked too much" with the police and was open to collaborating with the regime date to this period, although no one ever provided any proof. In '1972 he was released, but on probation, working as a translator, thanks to his knowledge of languages. He was fully released in 1982, with the modernization of Deng Xiaoping. Although the party supported the elimination of religions, Deng opened churches and seminaries, while controlling all activities of the faithful. Jin was chosen to open the Sheshan seminary and 1985 is chosen as the auxiliary bishop of Shanghai, without papal mandate. Msgr. Aloysius Zhang Jiashu, another Jesuit, was forced to be ordained patriotic bishop of the diocese while the ordinary, Msgr. Gong, remained in prison. Bishop Jin became the Bishop of Shanghai in 1988 and immediately began working for the renewal of the Church: restoration of buildings, contacts with foreign countries, strengthening formation for seminarians, publications in Chinese. At that time, many professors of the seminary of Sheshan were invited from outside. Among them Joseph Zen, who later became Cardinal of Hong Kong, and Savio Hon, a Salesian, current secretary of the Vatican Congregation of Propaganda Fide. Thanks to his relations with the leaders of the Party, Msgr. Jin even succeeding in gaining permission to name the pope in the Canon of the Mass and to use the liturgical books in Chinese (according to Vatican II) that the government forbade as a sign of "obedience" to the pope in Rome. But he was still a "patriotic" bishop. Meanwhile, after 33 years in prison, thanks to the pressure of several international personalities, Msgr. Gong, the ordinary bishop loyal to Rome, was released in July 1985. He was placed under house arrest until 1987, when he was sent to the U.S. for treatment. In 1979 he was proclaimed Cardinal in pectore by John Paul II, who only communicated his decision to the world (and to Gong himself) in 1991. Card. Gong died in 2000, exiled in the United States. In 2005, Msgr. Jin reconciled with the Pope and the Holy See established that Msgr. Fan was the ordinary bishop and Msgr. Jin the auxiliary. Being both very elderly, the Vatican called on both of them to think of a successor, and their decision rested on Msgr. Joseph Xing Wenzhi. This ordination was also one of the first in which Vatican and the government seem to have cooperated. In 2012 Msgr. Xing resigned, the reasons for this move are still not clear. The Church of Shanghai proceeded to choose a new auxiliary bishop in the person of Thaddeus Ma Daqin, ordained with papal mandate and accepted by the government as coadjutor bishop (with right of succession). But his refusal to remain within the Patriotic Association has brought new problems for the Church: Msgr. Ma was immediately isolated, the seminary was closed, all Church activities halted. Msgr. Jin has had to struggle for a lifetime with the issue of religious freedom. His death only further highlights the urgency of this issue both for Shanghai and the entire Church in China.